The CXT Architectural Railing uses 2 Classic Rail Kits to create a more robust style. Available in three colors, mix-and-match, CXT post sleeves, balusters and post caps will create a look you’ll love. Co-extruded from two layers of material, our CXT railing systems combine the dependability of time-tested technology on the interior with an ultra low-maintenance exterior cap stock, providing ultra scratch- and weather-resistance – and boasting our 25/25/25 warranty. All rails come predrilled for proper baluster spacing. 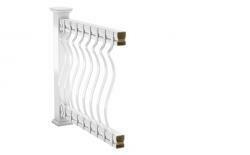 The Architectural rail is compatible with all Deckorators® baluster styles.